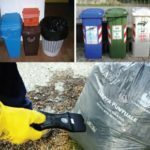 The Slovenian capital and three other municipalities, Vrhnika, Borovnica and Log Dragomer join the European network of Zero Waste municipalities. The mayor of Ljubljana, Mr. Zoran Janković announced today the commitment of his city to move towards Zero Waste. In a press conference which took place in the Town Hall of the Slovenian capital the mayor of Ljubljana together with the mayor of Vrhnika, Stojan Jakin, the president of Zero Waste Europe, Rossano Ercolini and the chair of the Scientific Committee of ZWE, Enzo Favoino, confirmed the adhesion of Ljubljana and three other municipalities to the European network of Zero Waste communities. With this move Ljubljana becomes the first capital in the EU to adopt the Zero Waste goal. Currently, Ljubljana is already the EU capital with best performance regarding waste separation and waste avoidance; it separately collects 60 % of municipal waste and generates less than 150kg of residual waste –what is not recycled or composted- per person yearly. Until 2025 they commit to increase separate collection to 78 % and decrease the amount of residual waste to 60 kg per person per year. With this commitment for zero waste, Ljubljana officially rules out building any incinerator in order to have the flexibility to continue reducing the non-recyclable waste and push for prevention and recycling. “Zero Waste Europe welcomes Ljubljana as the 1st Eu capital to go for Zero Waste, surely it won’t be the last one.” Said Rossano Ercolini, President of Zero Waste Europe. The other Slovenian towns to join the network of Zero Waste municipalities are Vrhnika, Borovnica and Log Dragomer. Today they collect and recycle over 76 % of its waste and on the average each resident creates 80 kg of residuals per year. By 2020, those municipalities will increase separate collection to 80 % and decrease residuals to 70 kg per person per year. To read the case study of Vhrnika click here. Erika Oblak, coordinator of Zero Waste Slovenia said “No reuse or recycling system will be successful without the participation of the residents. Today we celebrate with all who separately collect our waste and those who support sharing our resources with future generations”. On September 9, a conference will take place in the National Council of Slovenia –low chamber of the national parliament- to present the best practices from Zero Waste Europe and discuss the plans for zero waste implementation in Slovenia. The event is already fully booked, to follow up the results stay tuned to our twitter and newsletter. Today they collect and recycle over 76 % of its waste and on the average each resident creates 80 kg of residuals per year.